The Olentangy Local School District Board of Education voted last week to add additional classroom space to three elementary schools. 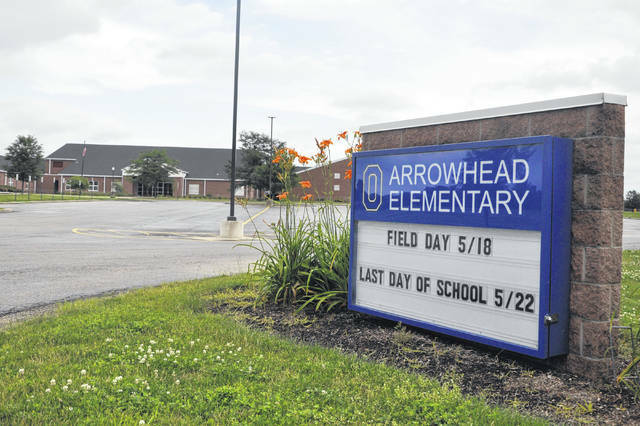 A six-classroom addition will be added to Arrowhead, Alum Creek and Wyandot Run elementary schools. Pictured is Arrowhead Elementary, located at 2385 Hollenback Road, Lewis Center. In a May 17 meeting of the Olentangy Local School District Board of Education, Facilities Committee Chairperson Sharon Jurawitz discussed the pressing need for additional elementary classroom space within the district. At last week’s meeting, the school board entered into a contract with Fanning Howey Associates, Inc. to build a six-classroom addition onto three existing elementary schools. Alum Creek, Arrowhead and Wyandot Run elementary schools were selected to receive the additional classroom space. Indian Springs and Cheshire elementary schools were also considered. The contract is valued at $553,989. Construction is expected to begin in the coming months and will be finished in time for the 2019-20 school year. In the May 17 meeting, Jurawitz said the district was heading toward having zero classroom space available in its elementary schools by the 2020-21 school year and would be operating with a deficit in available space beginning the following year. She also said enrollment in pre-kindergarten through fifth grade had increased by over 700 students since the last elementary school was built in 2012, and that projections predicted an increase of over 1,850 students in the next 10 years. Krista Davis, director of communications for Olentangy Local Schools, said that while the new classrooms haven’t been assigned to any specific grades or programs, a normal-sized classroom has anywhere from 20 to 24 students, depending on the grade. She estimated the new space will be able to accommodate roughly 400 additional students. Also discussed in the May 17 proposal was the building of two new, 35-room elementary schools, with the first being constructed in 2022 and the second in 2026. Levies would be needed in 2020 and 2024 in order to fund the proposed new schools. Sites discussed for the potential schools included district-owned land on Bean Oller Road, Bunty Station Road, Curve Road, and a location adjacent to Berkshire Middle School. In other district expenditures, the school board also approved the purchase of $364,733 worth of materials and resources for Berlin High School as it prepares for the opening of the district’s fourth high school. Of the total costs, $218,654 is for the purchase of books and other curriculum materials from publishing companies McGraw-Hill and Pearson, and $146,079 will be spent on instruments to equip the school’s music program. The music equipment is being purchased from Music & Arts, located in Westerville.